Last week’s Wordless Wednesday was an oxymoronic version, being that y’all were subjected to my lengthy lamentations about the change up of Holly’s weekly photo shoot. Wordless it was not. And like I didn’t have enough challenges, what with the drizzling rain and shortage of dog cookies, but still I was presented with yet another task by a fellow puppy raiser. You know, she says in a Facebook comment. 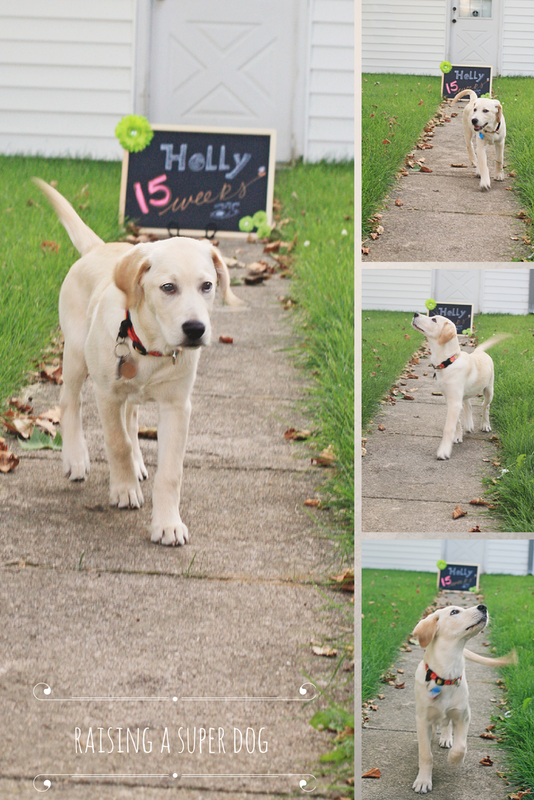 In your photo, Holly looks like she’s ready for the runway. She ended the comment with a hashtag of AmericasNextTopDogModel. And I respond with, Sure, just don’t call it a catwalk. But I can’t just leave it there. Not me. Oh hey, I continue. That gives me an idea. Next week, I’ll have her walk down the sidewalk like she’s a model on a runway. I just have to get the chalkboard in the background, I muse. And make sure everything’s in focus since the pup will be a moving target. Right, says fellow puppy raiser. You do that. With music. Oh, no matter. All I have to do is the what I usually do. And we present you with Holly at fifteen weeks. Strutting her stuff on the dogwalk. Music selection is the choice of the reader. We suggest humming to the tune Puttin’ on the Ritz. ‹ Wordless Wednesday: It be raining. Again. Super cute! She did a great job. Clapping paws and whistling! Such a Super Dog!! Thanks Beth. It took a few takes, then she was “oh, like this?” And then there was no stopping her, lol. Clapping paws, whistling and a dog cookie – a trifecta. All the motivation this girl needs. Thanks Bailey. Happy WW to you! She does seem to have a knack for this kinda thing, doesn't she? Wondering if I'll be sorry later, lol.